Wool undergarments feel more like a necessity than a luxury this time of year. Whether or not they are blended with a little silk, they cuddle your body’s warmth a little closer to your skin and protect you against biting weather from late fall to early spring. Still, if you’ve layered yourself or your child in organic Merino wool, it’s an investment you probably want to last a couple of seasons. The first step to making woolens last longer is to give them an airing between wearings. In northern Vermont, this means we need two sets to alternate as we wear them every day for four or five months. Wool needs more airing than washing as the fibers react with the oxygen in the air neutralizing skin secretions. 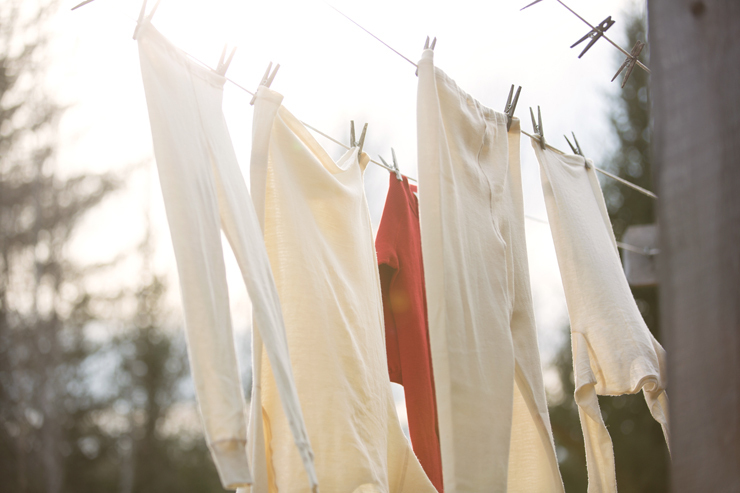 Washing is harder on the fibers and should be limited to an “as needed” basis. The next tip is to use the right kind of soap to clean your woolens when they just HAVE to be washed. Soaps designed especially for wool, like Eucalan, usually give you a couple of advantages. First, they are gentler. Second, they often have lanolin or other conditioning agents included in the soap that will help maintain the special characteristics of the wool. Third, they are often “no rinse”, which reduces the steps for washing. If you are using nappy pants or the cuffs of your child’s woolies are getting a little dingy, there are two more washing products worth mentioning. Sonett Wool Care adds lanolin back into the fibers. While not a soap, it helps maintain the water repellant nature of nappy pants. For stains on wool, Sonett Gall Soap is effective, yet gentle enough for woolens. Now you have to decide how to wash those woolies. They will last longer, with no felting at all, if you do it by hand. Use a sink of water that is a little cooler than you might use for a baby. Mix the wool wash into the water and then add the woolens. Swish them about, not too much squeezing, and then let them sit 20-30 minutes. Drain the water, roll them up in a towel to squeeze the water out, and lay them flat to dry away from strong heat or light. That is “best practices”. Personally, I am responsible for the wool underwear of five people, and at times, there have been multiple nappy pants and wool diaper covers to deal with, as well. Add in a couple of sweaters, and you might well imagine wool drying all over my house most of the winter. What I am about to say is not “best practices”, but it can be the difference in whether or not a family uses wool. Most washing machines have a “delicate” setting that is safe for wool, especially front loaders. Even with a very low spin, the woolens will be less waterlogged from the washer than after the handwashing method, and will therefore be dry faster. Unfortunately, you will have to experiment a bit with the best way to use your washer like this. I have tried it with two different machines; the first never felted any wool, whether I used warm or cold water. The second washing machine ever-so-slightly felted one set of woolies and completely felted all the homemade hats I put in on a warm/warm setting. It was a hard lesson to learn, and it might be worth it to you to stick to handwashing. Next, NEVER dry your woolens. I know of absolutely zero exceptions. Amazingly, that wool undershirt your child left inside their other shirt might be wearable after one trip through the dryer, but do not count on it. 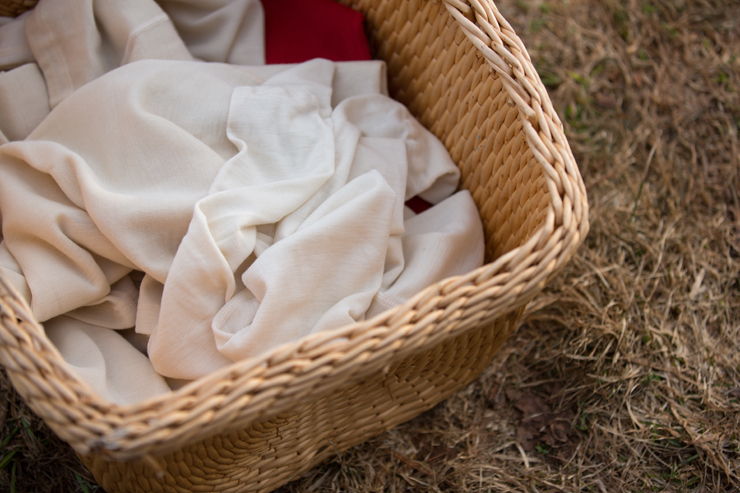 We have been gifted many felted undershirts that were too small for their current owner after just such an adventure. The good news is that they were still soft enough to wear, just small. Finally, when winter is finally receding, store your woolens well. Good, organic wool will not be treated with chemicals to repel moths or beetles, and it is very disheartening to pull out your winter things only to find them full of little holes. The first step to good storage is good washing. It is actually the dead skin cells or oils in the wool that mainly attracts these pests. You might choose one of the wool washes with lavender scent, as that is a natural repellant. Second, make sure the wool is completely dry. Last, close it up in plastic. 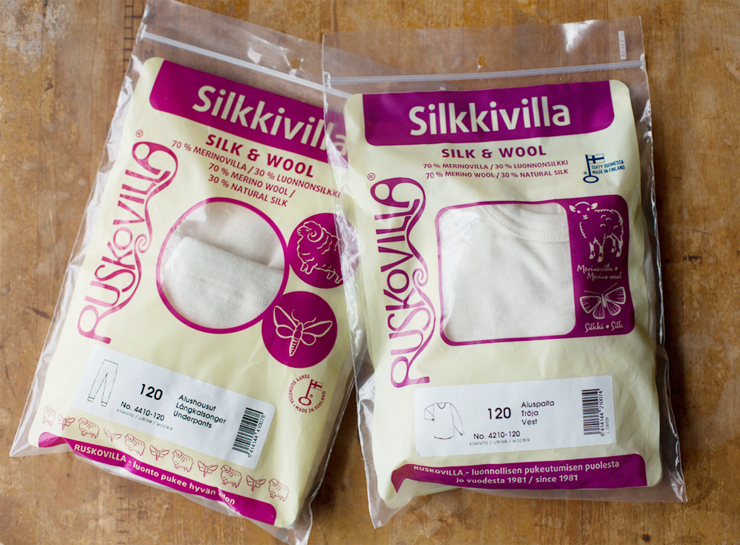 Ruskovilla comes in bags perfect for storing, but even a plastic kitchen bag will work great. With just a little care, your Ruskovilla woolens can last for multiple seasons, warming you or your child straight through the heart of winter. < Dress Up a Candle with Decorating Wax	> Physical Activity: Are Your Kids Getting Enough? Do you mean the bumps that form where the material gets the most wear? Like under the arms, the edge of the sleeves, on the inside leg? If so, these are just caused by friction, and probably it’s even like “point felting” in those places. I just leave them be, but if they bother you, you could use one of those shaver things people use on sweaters. I have found sweater combs a safer bet than the sweater shavers. The sweater shavers can quickly pull in and cut the yarn. I have my mother’s comb from years ago labeled “de-fuzz-it” and a recent one I purchased branded Dritz. I wash woolens by hand but after rinsing and a brief squeeze, I put them into my top-loading washer on the regular spin cycle only. They dry fairly quickly after that, and I even feel okay with hanging some items on hangers to dry. This is one of the reasons I have a top-loading washer, because I couldn’t use the spin cycle alone with my previous front loader, which, by the way, shrunk a favourite sweater on the delicate cycle.